Writing is one of the worst things you can do as a novelist, if you love it too much. This is especially so, I suspect, for those of us–and that may be most of us–who began as poets. Craft can distract you: the weight of the hammer, heat of the forge, the clang and flow of hot steel on the anvil–lines like that. They also distract the reader from the meaning of the novel, which is exposed less in the plot than in relationships. Character to character, characters with environment–just as in real life, which is so often sloppily plotted. In fact, Raymond Chandler said that “a good plot was one which made good scenes,” and scenes depend on those two interactions I just mentioned. I recently found a stash of the bad (and fortunately unpublished) novels I wrote in my twenties. This was while cleaning out my mother’s house after she moved into a care home. This sort of thing always stirs up the muck of memory, and it was, as well as tedious, decidedly unpleasant. My childhood involved no privation, or not any that I noticed at that age, though there wasn’t much money after the divorce, but the novels, which I wrote after I’d first gone out on my own, reminded both of how good and how bad a writer I was back then. Both the good and the bad stemmed from my skill at wordsmithing. Like so many other young writers, I overwrote, carried away by the grace of a well-wrought phrase. Florid descriptions and a tendency to be too exact, leaving too little to the reader’s imagination, made the works as coercive and dull as any gray bureaucracy, though generally elegant. I took them all–manuscripts, typescripts, photocopies–and dumped them into the blue recycling bins that would disgorge them, eventually, into a pulping machine. The world was safe from them, and so is my reputation, should I ever develop one. It is a discovery every generation of writers seems to make: that you can say more by saying less, and that overly-pretty writing results in literary bimboism. That I have not cured myself entirely of this tendency is revealed by occasional cavils in otherwise favorable reviews of my urban noir novels, such as these on Amazon. I am fortunate that my readers forgive the rare neglect of the “delete” key, the part of the keyboard that is the writer’s best friend these days. Another flaw, all too often unrelated to excessively graceful writing, was my tendency towards polemic. It was important back then that my protagonists reflect my politiical and social sentiments. This, of course, turned them into billboards rather than characters. I am now working in partnership with a protagonist, Lenny Strasser, who does things I wouldn’t do, and who doesn’t do things I would do. With his help, I have written 2.9 pretty good noir novels. He is a partner, not a puppet. Hard to put up with sometimes, but aren’t we all? By chance, I recently re-read Sinclair Lewis’s Babbitt, which is a sociopolitical screed that doesn’t become a novel till the last eighty pages or so, and I found it irritating even though I generally agree with Lewis’s philosophical positions. This confirmed me in my current practice. I now let my characters speak for themselves, not for me. Though, since as a writer I am playing god after all, I do punish them if they step out of line. Love and hate both have their consequences–and sometimes, as in the novel I am writing now, they can breed out of each other. Life is complicated and unfair, and retrospection often induces horror–as did my discovery of those ancient, awful novels. Onward to a confusing future, then! I am as curious an any reader to see what happens next in my new book. 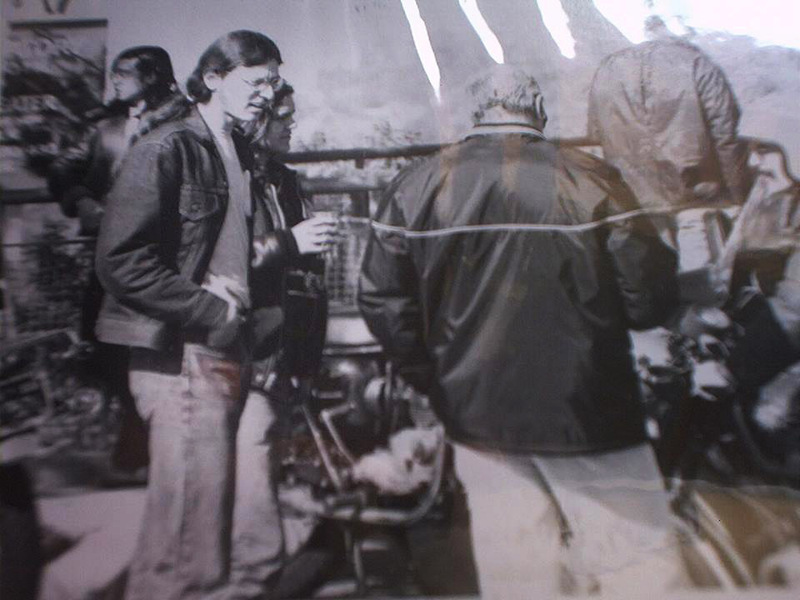 Photo, probably by Harv Woien, of me in my days as an earnest over-writer….